My trusty IBM Thinkpad X31 that Stanford bought me in 2003 has taken everything I've dished at it with only a couple of cracks in the case to show for it. At least, until recently. One awful afternoon, after hitting the power button I was briefly greeted with the message "Fan error" before it shut itself off. No amount of coaxing would bring it back. My desktop is truly ancient, dating back to the last millennium, so I had grown accustomed to doing most tasks on my laptop instead. The first task was to retrieve my data, which is easily achieved with a SATA/IDE to USB adapter. Only one screw needs to be removed to retrieve the hard drive. I was tempted to take the easiest but most expensive path: shell out for whatever passes for the best of the Thinkpad X series these days. But although working in industry means this remedy wouldn't sting as much as in my student days, it also means I don't spend as much time on my own machines. Now there's other things I'd prefer to get for that kind of money. Similarly, I didn't want to pay for it to be serviced. My only recourse was to attempt a repair myself. The Lenovo webpage about servicing the Thinkpad X31 spooked me a little. What's going on in that diagram? Do I have to take it apart into a hundred pieces just to replace a fan? The table suggesting that fan replacements should not be undertaken by end users wasn't encouraging either. With a heavy heart, I ordered a 67P1443 fan anyway. When it arrived, enthusiasm and impatience triumphed and I took out every screw I could see, but the fan remained elusive. 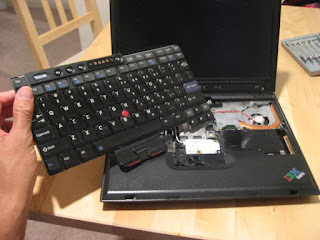 Eventually I regained some sense, and Googled for "thinkpad x31 disassembly". 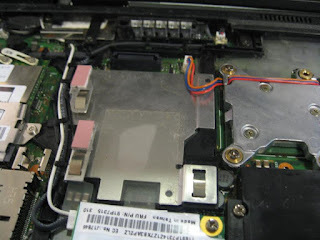 The first result contained a links leading to the official Thinkpad X31 hardware maintenance manual. I should have known. What isn't online these days? Fan replacements turn out to be almost trivial. After removing the battery and hard drive, I only had to remove the four clearly indicated keyboard screws, and then slide the keyboard out. Underneath, I discovered the reason for the fan error. Nestled in the fan blades was a tiny piece of foam, sticky on one side and rose-tinted on the other. A pink pad in my Thinkpad. I suspect that the fan is still operational, but since I had a new one and had already removed the five screws securing it, I replaced it anyway. Also, it's easier to apply thermal paste to a new fan than clean and reapply to an old one. The tougher part was figuring out where the pink pad belonged. There was another one in there somewhere that also looked like it had been slightly dislodged. I settled on pressing both of them against some metal frame in the center, where I presume they work best as shock absorbers. Soon after I received my laptop I wrote a webpage about Linux on a Thinkpad X31. Only when I started blogging did I realize it would be much easier (for me at least!) to maintain with blog posts, and that's probably what I'll do in the future if I have more to add. Sure, it's nice to have all information in one place, but this can be approximated through appropriate use of tags. Furthermore, the dates on each post may also give the reader some idea of how relevant it is. I switched to the ALSA driver from the OSS driver for my Creative Sound Blaster Live! card long ago, but I'm still not used to how MIDI is done. I'll record the relevant commands this time, so I won't have to look them up yet again. Lately, I've had to manually load the snd_seq kernel module. Programs I wrote that look at /dev/midi00 should now look at /dev/snd/midiC0D0. The behaviour of this device file differs too: I had to change my code so that it could handle a read() call that returned less than the requested number of bytes. To play MIDI files on my digital piano, I run pmidi -p 16:0 foo.mid. To send MIDI events to fluidsynth from my digital piano, I run fluidsynth 2> /dev/null (to get rid of spurious warnings), load a soundfont, then run aconnect 16:0 128:0.